Average Dairy Cow gives 2,00,000 glasses of milk during her lifetime. A glass of milk provides protein Calcium Vitamins. Milk is a super drink as it is great for our bodies and minds. It is Rich, Thick and Healthy. Pure Cow's Milk for Better Health. 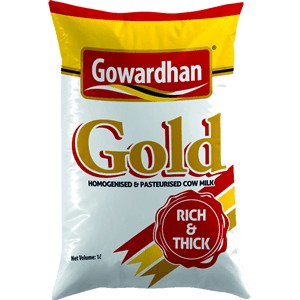 Gowardhan Gold Milk is Processed (Homogenious and Pasteriuzed) in Modern Dairy Plant, Using a time-testing and Ultra Modern technique to capture the essential Vitamins and Protien content. and the naturalness of Pure Cow Milk. It is a real source of to help Transport Vitamins A,D,E and K. It contains Omega -3 Fatty Acids, Vitamin E and Beta-carotene which has several health benefits and CLA to provide protection against several diseases. An OUT-AN OUT NUTRITIONAL SUPERIORITY FOR BALANCED DIET. 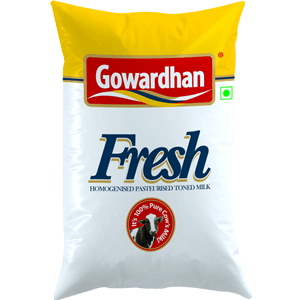 Gowardhan Fresh Milk is a Cow Based Toned Milk (Homogenious and Pasteriuzed) in Modern Dairy Plant, Using a time-testing and Ultra Modern technique to capture the Required Vitamins and Protien Content. It is processed in a such a way that it is extremely suitable for the use in Horreca, Institutions etc. It is Specially designed Cow based Milk with S.N.F content 9.2% and Fat mere 2% making it best suitable for Tea/Coffee Drinkers. 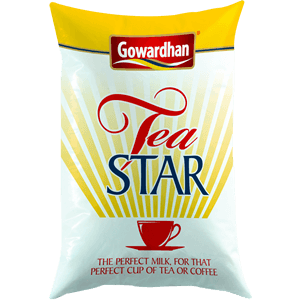 Gowardhan Tea Star Milk is a Cow Based Milk (Homogenious and Pasteriuzed) in Modern Dairy Plant, Using a time-testing and Ultra Modern technique reducing the fat content to mere 2% and raising the SNF bar to 9.2% making it best suitable for Regular TEA/COFFEE Drinkers. Best in the category.